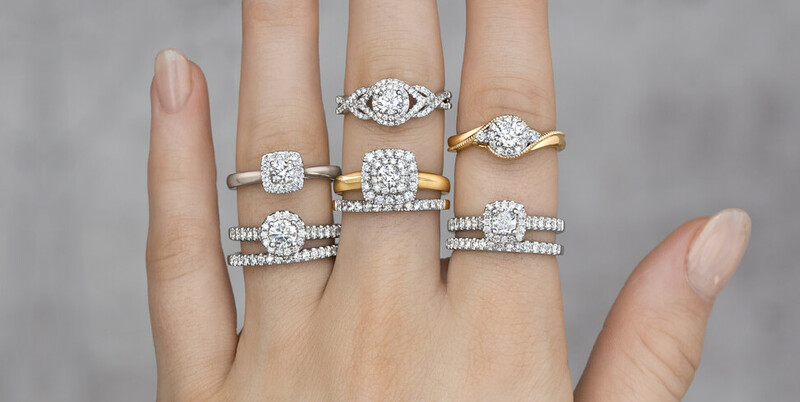 10 Split Shank Engagement Rings to Die For! At one point in history, it was common to be expected to drop the equivalent of two months pay on an engagement ring. You were to go to a respectable jewelry store in person and select a nice, fancy, diamond-encrusted piece of only the finest 24 karat gold for your betrothed to be. Luckily this is no longer a requirement. Engagement rings are symbols of your love and you should pick something you love, regardless of whether it is deemed expensive enough. Online retailers are on the rise and there is zero shame in picking the perfect ring from the world wide web. This rings especially true if both of you are in on it. After the engagement you will have an entire wedding to plan. If you can save a few bucks on the ring, you will have that much more to drop on the wedding or honeymoon or a place together if you are not already living under the same roof. Before we begin with our list of split shank engagement rings, let us first go over a bit of anatomy in a ring. The reason split shank engagement rings work so well is the design offer two things. First, you can have a larger stone without it lifting so high off your hand. Second, it allows for more shapes and texture to be added to the architecture. To better understand how and why this works, let us take a look at the anatomy of a ring. The stone in the very center is called the feature stone. If it is alone in the setting it is called a solitaire setting. Alternatively, one stone surrounded by a ring of smaller stones is called a halo setting. 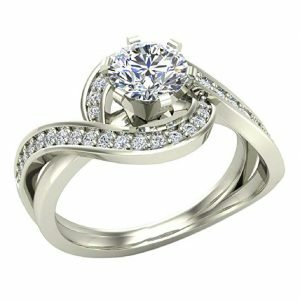 In the case of two or more stones that are the same size, they are both feature stones and it is referred to as a dual setting. Finally, as far as stone terminology goes, additional smaller stones that surround a larger feature stone are called accents or accent stones. The space underneath prong set stones is called the gallery. The gallery allows a place for the bottom part of the stone. These are largest with the princess and round cut stones that include quite a bit of stone below the face. In order for the stone to sparkle most brilliantly, light needs to be able to enter the stones from as many angles as possible. The gallery allows that light access. Most stones are set with prongs or little tabs of metal, that pinch the stone in place. Underneath the widest part of the stone is the gallery rail. It supports the lower part of the stone to keep it from slipping down into the gallery. There are also bezel setting with a ring of metal wrapped around the stone. Additionally, there are cabochon and tension setting but these are less common in rings marketed as engagement rings. However, an engagement ring can be any style, despite current trends in marketing and purchasing. Final is the band. The sides of the ring are called the shank. A split shank ring divides before joining the gallery or setting. This allows the jeweler to lower the gallery on the ring. 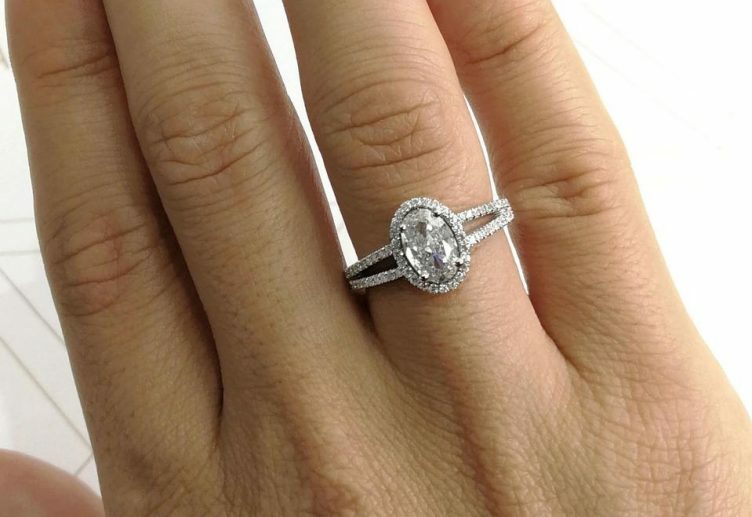 Larger stones do not have to rise as high off the finger with this arrangement. It also adds visual interest. The shank may feature stones embedded into the metal. This may be a pave or channel setting to keep the stones in place. The inside of the shank may be hollow or grooved, depending on the architecture of the. Often any hallmarks, maker’s stamps, or metal stamps are included on the inside of the shank. Finally, you have the sizing band. This is the band of metal that sits around the inside of the finger, on the palm side. The ring can be sized by adding, removing, or stretching this band. Now you have the basic anatomy and terminology of rings. There are a lot more things that can go into a ring but for the purposes of engagement rings, you have got the basics. Here is our list of gorgeous split shank engagement rings any guy or gal would die to have! Our first find is from Amazon’s personal collection. A heart-shaped gem in your choice of four varieties is held in place by three prongs. You can select from lab-created emerald, opal, pink sapphire, and ruby. Our favorite is the ruby so that the heart is red but you, naturally, can choose your favorite stone for your engagement. This split shank includes rows of rows of pave set cubic zirconia. The feature stone is also haloed by cubic zirconia. One of our favorite features is that the creators decided to set a single diamonte stone in each of the prongs holding in the feature stone. 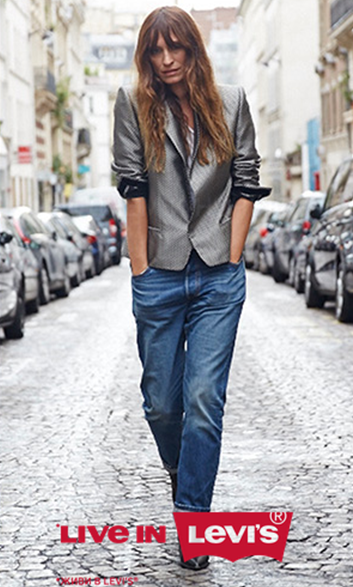 This adds an extra boost of sparkle and uniqueness that we adore. This is a sizeable stone for a reasonable price. 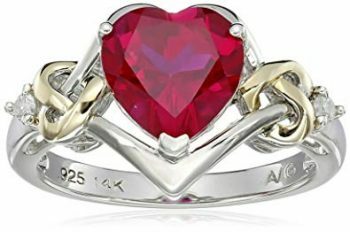 Because this ring is in 925 Sterling Silver and includes a cadre of lab-created stones, Amazon is able to keep the price incredibly low for what it is. 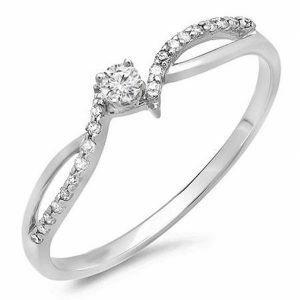 This is a wonderful option for an upgradeable or anniversary replacement ring. While many couples choose to keep their engagement rings as a permanent, unchangeable part of their jewelry, it is a recent trend that less expensive rings are selected at first. At major or significant anniversaries stones may be replaced with more valuable versions. Or the rings may be swapped out entirely. Created by Diamondbella, this is a beautiful example of experimental stone cutting. The lab created cubic zirconia is sized equivalently to a five-carat diamond. The stone is cut with eighty-one facets which means it glitters so ferociously it will look like trapped lightning on your finger. Most round cut brilliant stones feature fifty-eight facets. This one adds a full third to the mix. The face of a diamond, or in this case a diamante stone, has what are referred to as hearts and arrows as you look down into the stone. 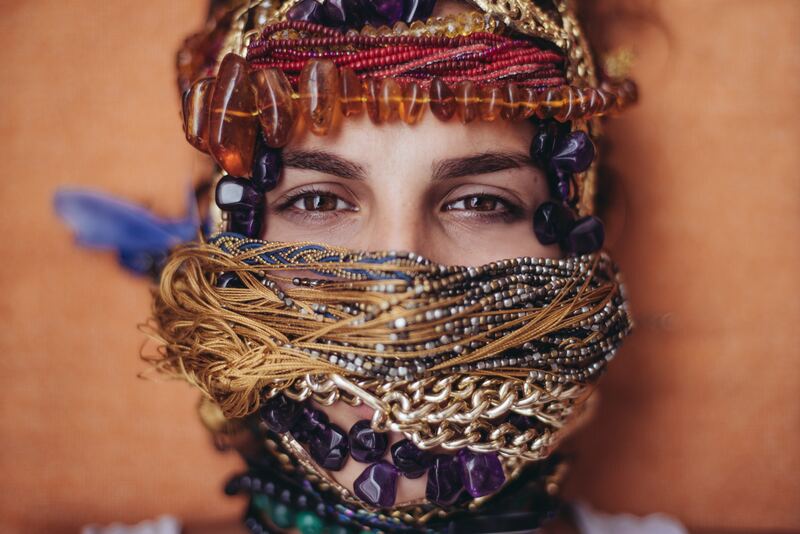 These are illusions created by the facets. Most traditionall cut stones have eight hearts and eight arrows. This ultra-faceted stone features ten hearts and ten arrows. The ring itself begins with 925 Sterling silver that has been plated with platinum. The platinum adds a uniquely white color to the metal. It is a warmer tone than sterling but still cooler than white gold. It is also one of the finest metals currently used in jewelry. Rows of additional cubic zirconia climb up the shanks in pave settings. This ring features an additional element we love. Hiding the typically boring architectural and structural supports of the gallery is a bezel set cubic zirconia. 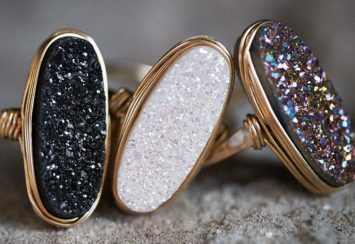 This means that you have a bit of bling and sparkle glittering away from every angle of this ring. Even underneath the feature stone. We love the subtlety of this split shank ring. Created by Dazzling Rock, the band is available in both white and yellow gold. The shank splits and crosses over itself with a solitaire round brilliant cut diamond braced in the center in a four-prong setting. One shank is coated in additional diamonds. In total this gentle ring features over one-tenth of a carat of real diamond. This ring is gorgeous and perfect for folks who do not tend to prefer flashier rings. It has enough drama with the crossover shank. But it is such a thin ring, the effect is stunning. A lot of bling without absorbing a lot of real estate. While yellow gold is still the most popular gold-tone in jewelry purchases, white gold has risen to prominence in bridal jewelry. Yellow gold technically goes with everything but many couples find the color a little jarring when coordinating with outfits. Because for most people wedding rings are a permanent piece of jewelry, white gold seems to be a little more versatile and forgiving. This clever little piece comes in both popular gold tones so you have the option of traditional versus modern stylings. This ring will present challenges in matching a wedding band. You may need to have a custom band created. We recommend an infinity band custom cut to a mild chevron to match. This creation by jewelers Houston Diamond District offers the best of two worlds. You get just under one carat of diamonds across the crossover split shank. The feature stone is a stunning round brilliant cut moissanite stone equilant to three-quarters of a carat. All of this is set in a warm 14k white gold ring. Moissanite is an out of this world stone. In its natural form the silicon carbide stone is only found in meteorites, meteors that have landed on earth. It is almost as hard as natural diamonds and just as stunningly beautiful. This ring features lab-created moissanite, a close cousin of cubic zirconia. Cubic zirconia is a brilliant white color, leaning a little more to the side of silver and refracts light similarly to diamonds but tend to be slightly less sparkly. Moissanite is not quite as hard as cubic zirconia thus prone to scratches but it is closer in color and sparkle to real diamond. This ring pairs the two effortlessly. You will have an actual diamond ring with a sizeable diamonte solitaire stone for a fraction of the price. A real diamond measuring in the three-quarter to one carat range would set you back a pretty penny. This stone keeps a little more moolah in your wallet without sacrificing the drama you hope for with a sizeable stone. We love the drama and detail of this split shank option. Diamonds have been a standard in engagement rings since the early twentieth century. Prior to that, however, engagement rings tended to feature a wide variety of precious and semi-precious stones. This split-shank beauty harkens back to those days featuring a natural emerald. Another creation offered by Houston Diamond District, nearly one carat of diamond dances across one shank of this ring. Available in rose, white, and yellow gold, the shanks weave around each other in a braided infinity style shape. 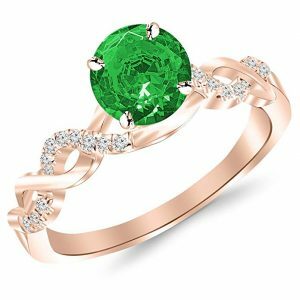 Both wrap around each other and support a stunning round cut emerald. Emeralds typically tend to present in an emerald, baguette, or radiant cut. So to find this ring with its round cut stone is a real rarity. The natural emerald tends to lean a little more toward the warm tones of greens so it pairs beautifully with the warmth of yellow and rose gold. The non-standard stone in an engagement ring will be a conversation starter for sure. The ring itself is fairly straightforward. But with all the curves and twists of the split shank, there feels like there is a lot more going on. There is a lot for the eye to follow. It still manages not to feel overwrought or overworked, however. We love this ring for a more adventurous couple who may thrive off throwing convention to the wind. We return to makers Dazzling Rock for this duo set. The engagement ring makes the most architectural use of the split shank, allowing the gallery to nest in a little closer to the finger without sacrificing room for sizeable stones. Available in both white and yellow gold in 10k, this ring features a third of a carat worth of diamonds. The feature white diamond is flanked by richly blue natural sapphires as accent stones. All three stones are cut into the very trendy princess cut. The shank is split for the low slung gallery and coated in yet more white diamonds. Finally, the wedding band includes yet more white diamond channel set across the full shank of the ring. Please note this is not an infinity band as the diamonds do not wrap all the way around the ring. We are great fans of duo sets as it takes out the mystery of whether you will be able to find a suitable band to match that perfect engagement ring. 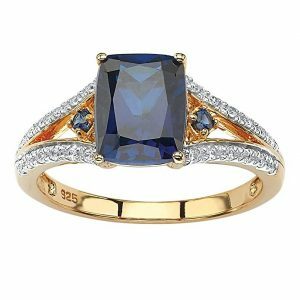 A lab created wonder, we adore this use of yellow gold and the warm navy blue tones of lab created sapphire. 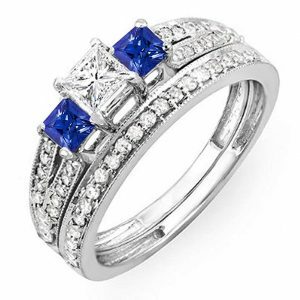 An emerald cut sapphire feature stone is flanked by two round cut, prong set sapphires. The split shank simply drips with white cubic zirconia. The band is yellow gold-toned 925 sterling silver. 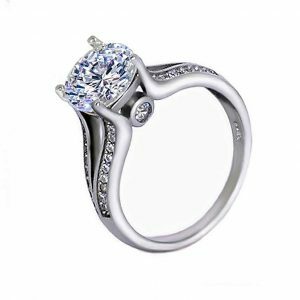 You get so much ring for the price, it is proof perfect that lab-created stones and sterling silver do not need to look any less stunning than their pricier counterparts. The emerald cut is perfect for the sapphire. Sapphire is more known for the beautiful tones of blue as opposed to the sparkle. Emerald cut allows the depth of tone to shine through, leaving much of the stone flat and unfaceted. By not chipping away at the stone you get as much of the beautiful color while being less finicky with the angles. It preserves the natural beauty of the stone while still allowing for light play to achieve a particular glimmer. We also adore the choice to create this in yellow gold-tone metal. 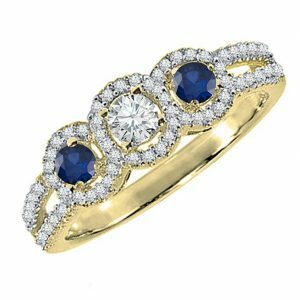 The navy blue stones (although the color may vary slightly from ring to ring) are so warm and inviting, the yellow gold is a perfect complement. Cooled off by the white cubic zirconia, the ring does not fall into an overly vintage trap. This may very well be our favorite piece on this list. The shank splits low on each side, dividing into a wider and a narrower column. One side features channel set diamonds that swirl and wrap around a generous three quarter carat round brilliant cut white diamond. The other shank gleams brightly in 14k white or yellow gold, providing balance and support. All in, this piece is a powerful one carat assembly. The diamonds are certified for their color, cut and clarity by respected industry experts like the CIA or IGI Laboratories. When making such a substantial and important purchase online, those reassurances that you are getting exactly what you need are necessary. This is absolutely a statement ring in every way. The shanks seem to swim around this massive diamond solitaire. The eye is instantly drawn to the feature stone and it lives up to every expectation. This is a perfect piece for a wedded-to-be who cannot get enough bling, glitz, glamour, and elegance. 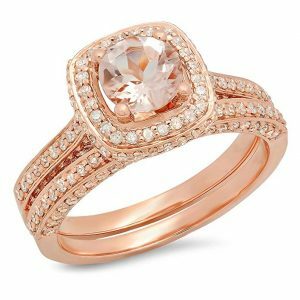 Rose gold is slamming into the wedding market just as hard as it hit the rest of the jewelry world. 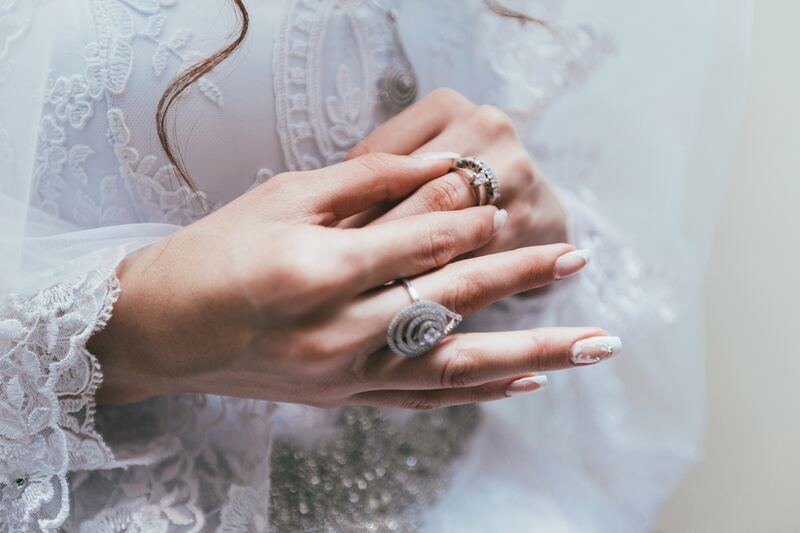 While yellow gold still dominates in the jewelry market as a whole the 2000s and 2010s saw a massive rise in popularity for white gold and silver tones in the bridal sets. But in the last few years rose gold has really seen a surge in the typically hard to crack the wedding market. This ring is one surefire way to crack that wedding wall. A champagne colored morganite stone is haloed by fiery white diamonds all set in warm, blush-colored gold. It walks the line of classic wedding wear and unique vintage finds. Morganite is a somewhat rare stone named after famous banker and gem lover J.P Morgan, now of J.P Morgan Chase Bank fame. The financier was a proponent of all gems and the peach-toned pinks of the stones was one of his favorites after its discovery in the early twentieth century. Today it adds a beautiful, rich elegance to this out of the ordinary split shank engagement ring. The split shank allows the ring to sit lower on the hand so despite the hearty size it poses less of a danger to snagging and catching. It does this without sacrificing the drama. This is perfect ring for folks who enjoy defying expectation and tradition. We know there is a couple who will find this fiery ring just as hot as we do. Our final pick takes the split shank and doubles down on the beauty. Available in white or yellow gold, the split shank divides and then enshrines a three-stone assembly. A quarter carat white diamond is flanked by two stunningly blue sapphires. All three stones are wrapped by the split shanks with prong set diamonds. It has a wonderful halo effect while not quite being a halo arrangement. The ring is bold in its design and has a relatively low profile for its architecture. Choose the 14k yellow gold to keep a temperate feel about the ring. For a cooler, icier look select the 14k white gold. Either choice is beautiful in its own right. No matter how you swing it is a wonderful engagement ring. We love three stone selections for engagement rings. Each of the sapphires represents each member of the couple while the single diamond in the center represents the depth and beauty of your relationship. Add a touch of elegant symbolism to your engagement ring with this creation by Dazzling Rock. 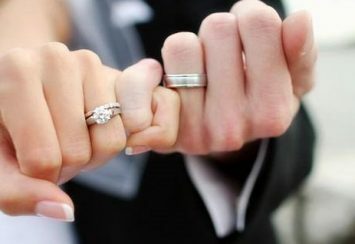 There are two types of relationship rings commonly given prior to the wedding ring. First is a promise ring. This is often a less fancy ring given in an early part of the relationship. It represents the promise of betrothal in more archaic views. Today is most often symbolic of the promise of togetherness. It is sometimes given when a couple agrees to exclusivity but that is not always the case. It has been a recent trend that both parties of the couple wear promise rings. Many couples do not share promise rings at all, however. Engagement rings are far more popular and are given at the promise to marry each other. Often this is a hallmark of exclusivity and the start of planning a wedding and a life lived exclusively together. The etiquette of engagements and engagement rings has shifted in recent years. Through the 90s it was expected that the proposing partner save up in secret, sneak away to purchase the ring and surprise their beloved with both a ring and proposal. This was always a huge risk. Not only could the surprised one say no but, even if they said yes there were countless things that could go wrong with a ring. It might not fit but that could be remedied. Worse than that, they could hate it. The turn of the millennium saw a shift in engagement ring purchase habits. Now it is not uncommon for both parties to go ring shopping and choose one together. This allows both people to weigh in. 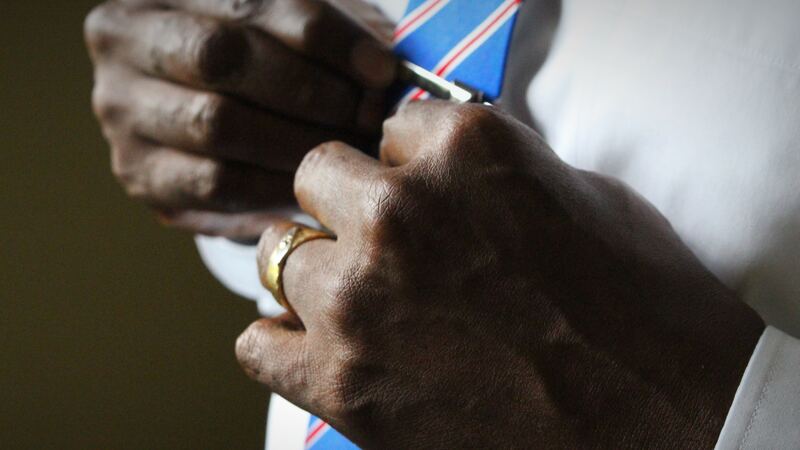 It also ensures that the ring will be crafted to the proper fit. In cases such as this, there might still be a surprise proposal for the experience of it, but there would be no question of a yes and a perfect ring. 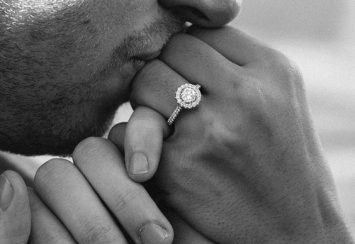 The dreaded question always arises with engagement rings, “What happens if we break it off?” It is nothing anyone really wants to discuss but it does happen. 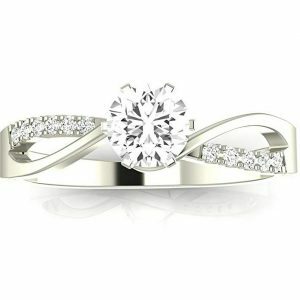 If you are and your significant other decided to call it quits before the wedding, what happens to the ring? The answer is slightly complicated. 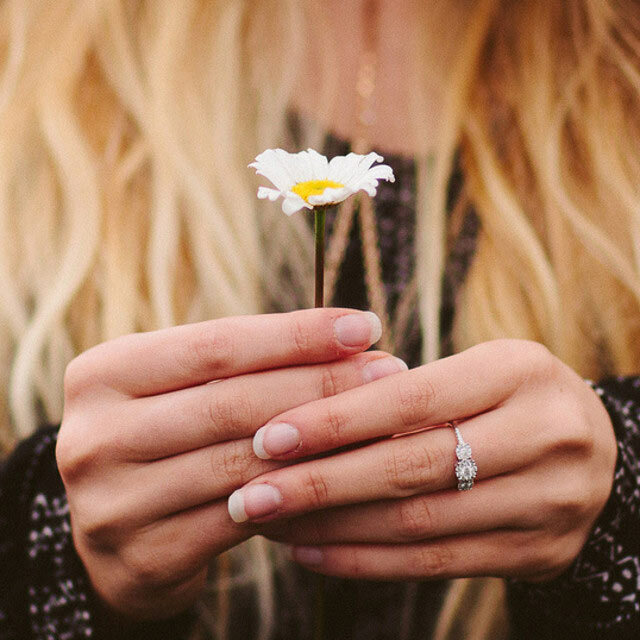 Most US states consider an engagement ring a conditional gift. When a gift is given outside the confines of a bracelet it is normally termed an unconditional gift. That means that if you present your significant other with a pair of earrings to show your love and appreciation, those earrings become theirs, even if the relationship ends later. However, an engagement ring is given with the expectation of a legally binding marriage to follow. If that condition, in this case, the marriage, is unfulfilled, the original purchaser of the ring has the right to ask that the ring is returned. When brought before a court of law in the United States, most judges have required the recipient of the ring to return it to the original purchaser. With that legal precedent in mind, many simply allow the recipient to keep the ring rather than ask for it back. 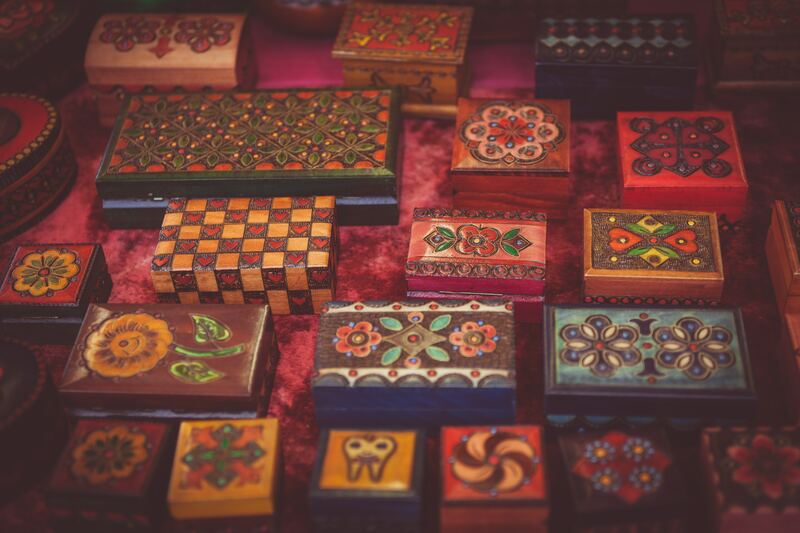 While the law considers it a conditional gift, many people feel it was given freely as a gift, thus they do not ask for its return if the engagement falls through. it is considered bad luck to reuse an engagement ring or wedding ring that came from a broken relationship. 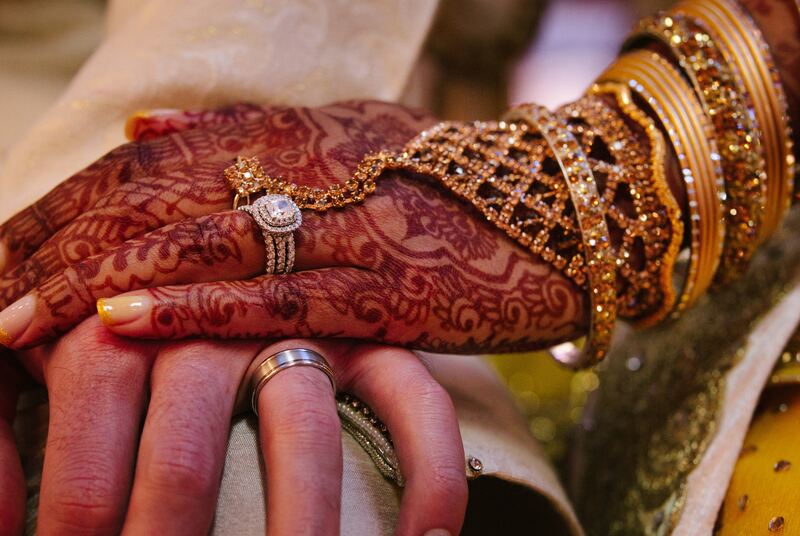 Rings as a symbol in relationship represent the unbroken love each party has for one another. However, if the relationship breaks, the thought is that they bad intentions and thoughts are trapped with that ring. It will curse any future relationships it becomes associated with. Purchasing a wedding band may be slightly more difficult if the ring does not come as part of a set. Because most split shank engagement rings are not straight across bands, instead featuring a curved edge to allow for the extra stones, it may be difficult to wear it with a straight, traditional wedding band. There are curved, chevron and notched shaped bands available but you will likely need to go to a jeweler to find the one that fits your engagement ring. In some cases, a custom band will need to be created to wear snugly with your split shank engagement ring. These may have additional stones or they may be plain, depending on your budget and taste.